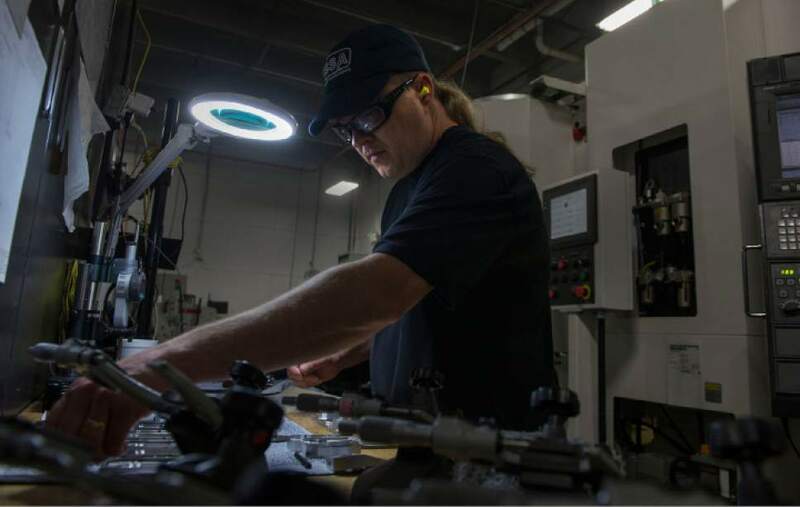 How did two Utah sound studio partners create one of the largest firearm silencer companies? Waldron's hearing loss from hunting stirred interest in suppression; partner's background in sound helped create better end products. Leah Hogsten | The Salt Lake Tribune Silencerco machinist Gordon Wellington manufactures baffles for one of the company's silencers. Silencerco is one of the country's largest manufacturers of silencer for guns of all kinds, Friday, May 28, 2017. 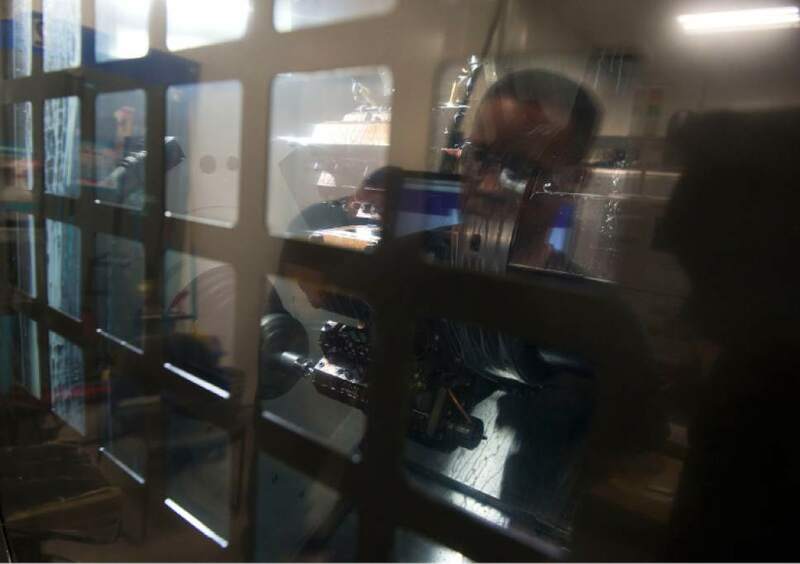 Leah Hogsten | The Salt Lake Tribune A gun baffle in production will reduce the amount of noise and visible muzzle flash as gases decrease in the small facets of the chamber. Silencerco is one of the country's largest manufacturers of silencer for guns of all kinds, Friday, May 28, 2017. 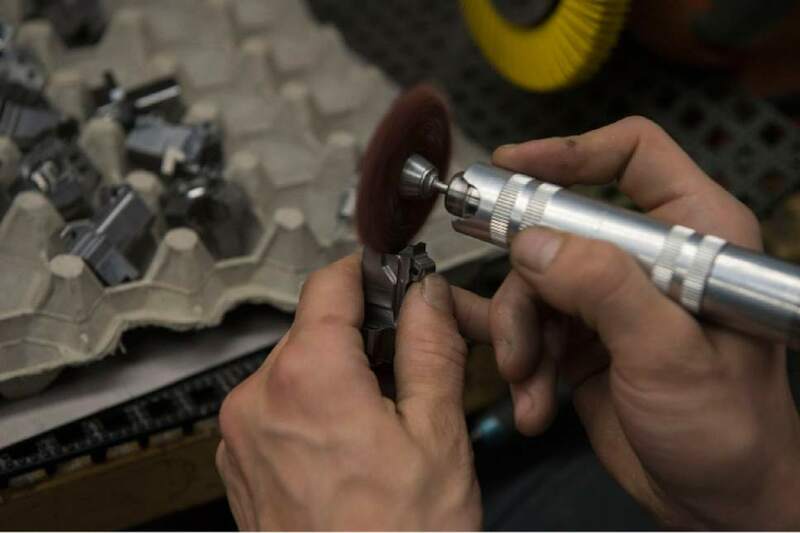 Leah Hogsten | The Salt Lake Tribune Silencerco machinist Shawn Colby makes suppression parts for a Maxim 9 handgun, designed by Silencerco and billed as the "world's fist integrally suppressed" gun. Silencerco is one of the country's largest manufacturers of silencer for guns of all kinds, Friday, May 28, 2017. Leah Hogsten | The Salt Lake Tribune Silencerco machinist Gordon Wellington manufactures baffles for one of the company's silencers. Silencerco is one of the country's largest manufacturers of silencer for guns of all kinds, Friday, May 28, 2017. Leah Hogsten | The Salt Lake Tribune Silencerco's Robert Brouillette deburrs gun parts in the manufacturing facility. Silencerco is one of the country's largest manufacturers of silencer for guns of all kinds, Friday, May 28, 2017. West Valley City • A decade ago, Silencerco co-founders Joshua Waldron and Jonathon Shults ran a sound-recording studio for musicians, including Utah pianist Paul Cardall. While chatting periodically about Waldron&apos;s passion for hunting and the damage he believes it has caused to his hearing, the boyhood friends from American Fork became convinced they could build a better suppressor for firearms. "All hunters as they go into middle age have hearing loss," said Waldron, now 39. "Hearing aids are more expensive than a suppressor." Although Shults has no college education in engineering, his knowledge and experience with sound drove him to experiment. The company, which began in 2008 with only Waldron and Shults, now has 290 employees, with more than $70 million in revenues last year, Waldron said. While the silencer industry is competitive and generally keeps production figures confidential, Silencerco is "likely the biggest manufacturer of suppressors," said Knox Williams, executive director of the American Suppressor Association. Waldron is one of his 13 board members. Shults came up with a suppressor for a .22 that can be taken apart and cleaned. Then he abandoned the standard round-tube design and introduced the first suppressor shaped like a hexagon. He later developed a way to mount a silencer below a gun&apos;s barrel, making it easier for a shooter to zero in on a target. "His suppressors also were smaller and lighter than all the others on the market," said Silencerco spokesman Matt Pinnell. "We made it user-friendly, built it better and used new-age materials [such as Stellite] to lighten it and shorten it up. … He also created sound chambers big enough to really absorb a lot of the sound." Consequently, Waldron said, "while this was a side job, a hobby company, we quickly learned we should put all of our eggs in this basket." 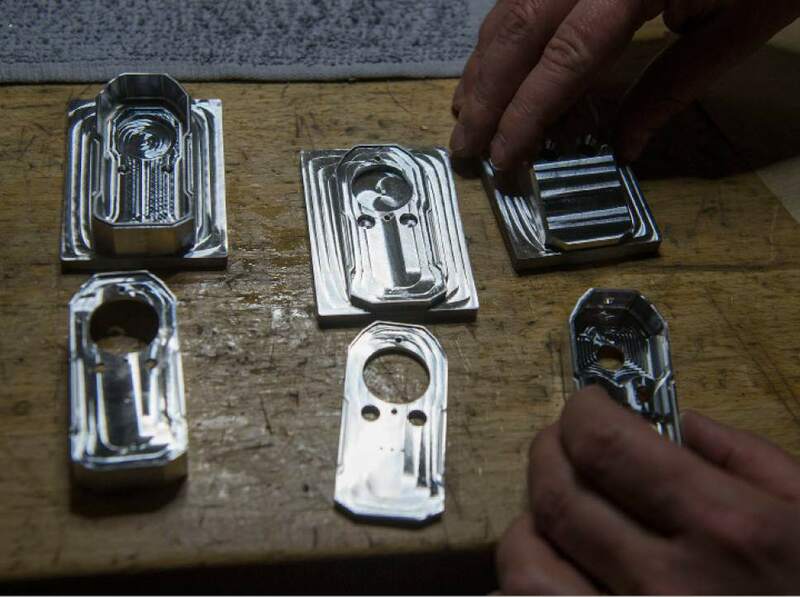 The company started with one CNC [computer numerical control] machine, which can cut metal and wood parts to specific dimensions that are programmed into computer-aided design software. Now, it has close to 60 machines inside a 72,000-square-foot manufacturing center in West Valley City  twice the space Silencerco occupied in its first five years. "Our campus is pretty big and chock full of machines, each one serving a certain process," Pinnell said on a recent tour. Nearby, machinist Shawn Colby, 43, of West Valley City, assembled parts for Silencer&apos;s pride and joy: the Maxim 9, a pistol with an internal silencer that sells for $1,499. Most other silencers for shotguns, rifles and pistols sell for about $1,000, although prices are cheaper for small rimfire pistols. Elsewhere in the plant, machinist Gordon Wellington, 42, of Salt Lake City, put silencer parts through an anodizing process to increase their resistance to corrosion and wear. Robert Brouillette, 20, of Tooele, used a spinning metal sander to remove burrs so that the metal has "a silky feel." 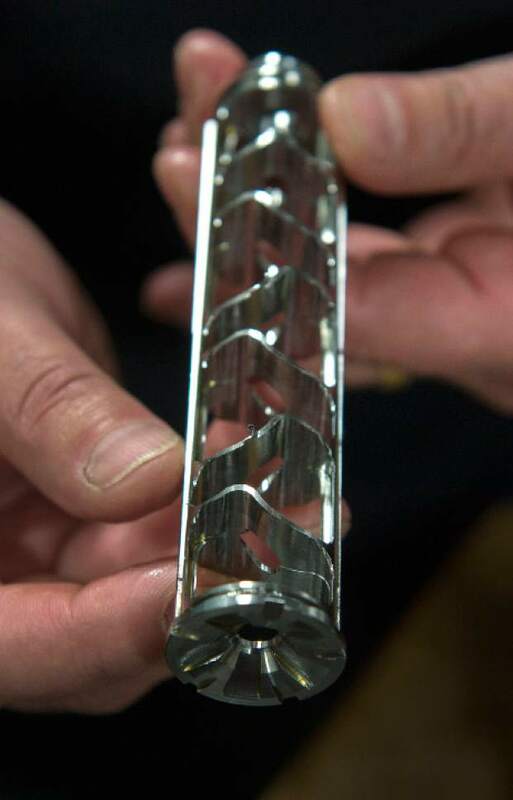 The company also dedicates several CNC machines to research and development, so Silencerco can move faster than competitors in bringing new concepts to market, Pinnell said. "Whether cutting out vessels or welding materials together or testing tension strengths, there&apos;s a lot that goes into making sure the end product is what we want it to be," he said. "We bought a lot of machines and that&apos;s resulted in us becoming world leaders."